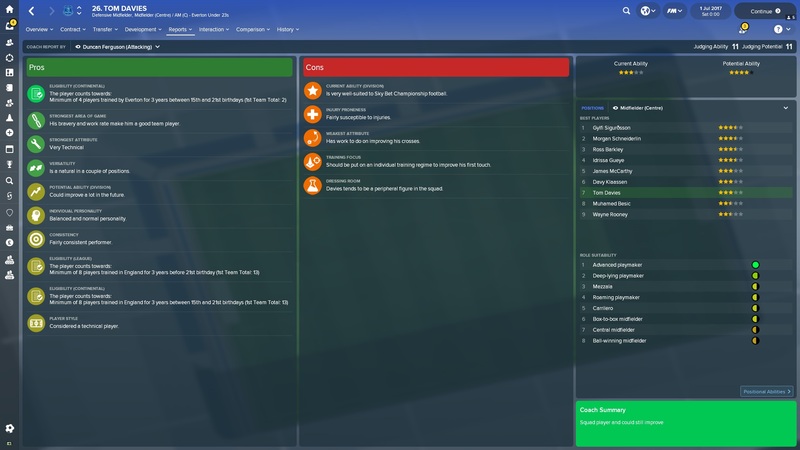 Hello and welcome to a Football Manager 2018 player guide. In this series of articles we look at various youngsters in-game. We take a look at how you can improve your development of this player and how they progress five years into the future. In this guide we look at Tom Davies. Tom Davies is a central midfielder who can play both in the DM and AM positions. He is most suited to playing as an advanced playmaker but is certainly comfortable with being a deep-lying playmaker. He has great attributes in technique, passing and vision and is mentally very solid for an eighteen-year-old. One of the most concerning factors from his report is his injury proneness; he is considered to be fairly susceptible to injuries. On a positive note, Davies is a fairly consistent performer and could improve a lot in the future. I think it is crucial for Davies’ further development that he receives first-team football this season. He is ranked 7th in the list of central midfielders in the Everton squad (according to Duncan Ferguson and his coaching report) and therefore may not get as much football as he needs with Everton. A loan out to a top division club for consistent first-team football may be an option, but if I were manager I would prioritise Tom’s development over some of the other central midfielders. I would be tempted to train Davies in the mezzala role, a role new to FM18 this year. Highlighted in the screenshot below are the attributes in which the mezzala role trains. The mezzala role trains a fair few attributes compared with other training roles, meaning that more attributes are given attention in training. 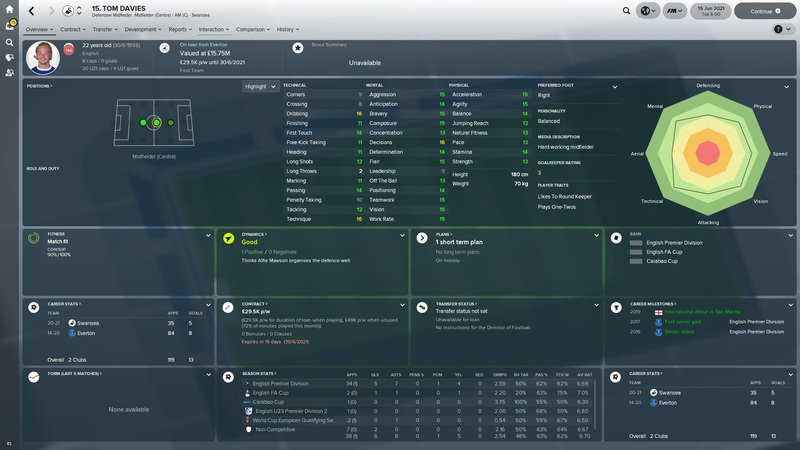 Tom is already very well rounded and so you may well prefer to train him in a role with fewer attributes in focus, such as the advanced playmaker role. This would mean that specific attributes would be given greater attention and therefore they’d be more likely to improve. I will train Davies in the mezzala role for a year, but if I feel that not enough progress is being made I would change up the role I’m training him in. Tom Davies has a balanced personality and hopefully, through player tutoring, I could improve his personality to a more beneficial one, such as determined, professional or resolute. There are several potential tutors in the Everton squad and I have listed Idrissa Gueye as my choice below. Gueye plays in the same position as Davies and has a resolute personality which can hopefully be shared with Davies. 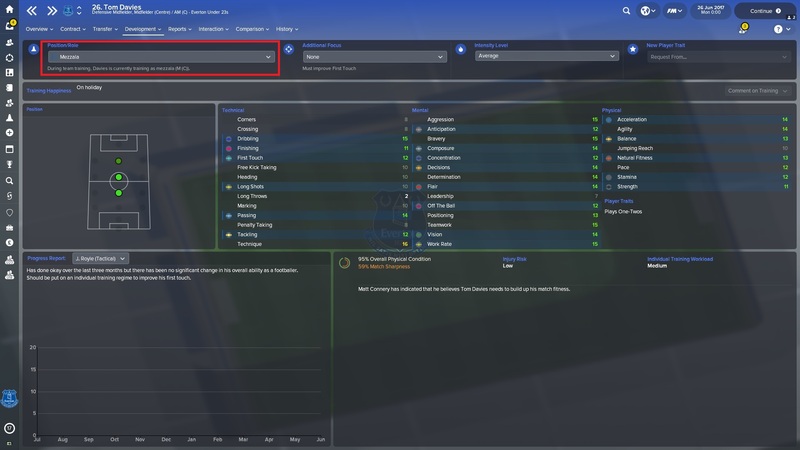 As you can see from the screenshot below, I’ve highlighted the second tutoring option as this is the option that focuses on a player’s mental side rather than their player preferred moves. Mentioned slightly earlier was the importance of first-team football for Davies’ development. It must be remembered that if you send Davies out on loan, he won’t be able to benefit from tutoring and won’t necessarily be trained in the way that you’d like. He also won’t be guaranteed first-team football, no matter what the loaning team promise. I’d keep hold of Davies and play him as a first-team regular with Everton. Playing week-in-week-out in the Premier League would really help his footballing progression. Tom Davies will be pleased with the progress he has made in the last five years. The Everton youngster made 17 appearances for England and has remained loyal to Everton, signing a contract extension to keep him at the club until 2026. At first, Tom struggled to break into the Everton first team on a consistent basis, instead only being given substitute appearances. He spent a season on loan out at Swansea in the Premier Division and returned a better player. In the latest season Davies played in 36 out of 38 Premier League matches, though he’ll be disappointed with a poor average rating of 6.51. First team development out on loan could be deemed a success in Tom Davies’ case. Though he hasn’t performed as well as he would have liked for Everton, first team football on loan at Swansea has aided his development. 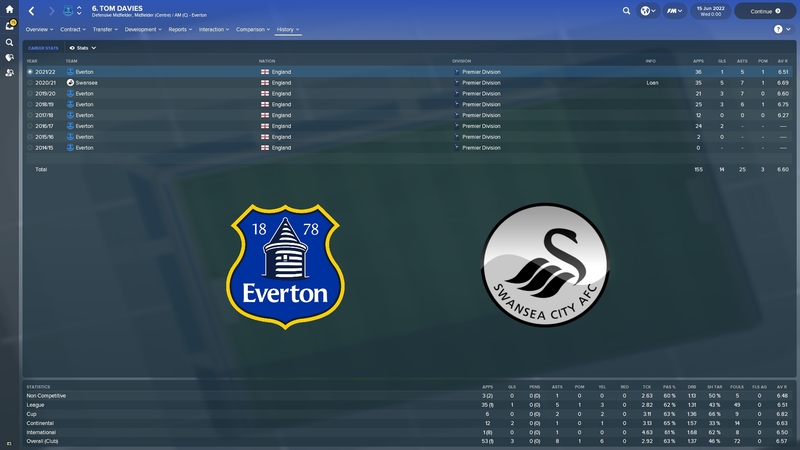 Tom Davies has had a satisfying five years in FM18. He’s made close to 150 starts for both Everton and Swansea, contributing to 47 goals in total. His pass competition of 64% may seem low, but it all depends on the role Davies was playing. I’ve found in my personal saves that a deep-lying playmaker or central midfielder has a better passing % than a mezzala or an advanced playmaker. A creative player is likely to be put into a role that encourages risky passes. This would therefore increase the likelihood that a player misplaces a risky pass. Considering that Davies has over 30 assists I’d assume he was playing in a ‘risky passing’ role. 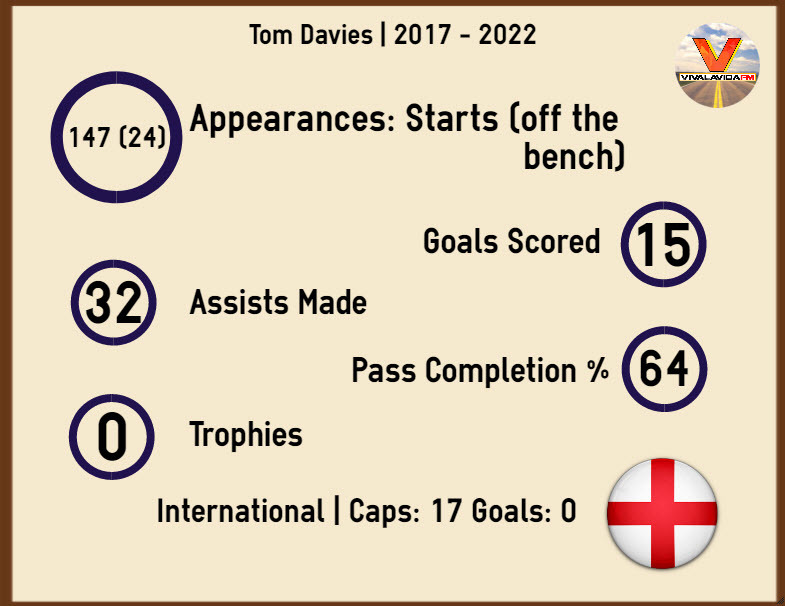 Thank you very much for reading our FM18 player guide to Tom Davies. Do you have a player that you’d like us to review? Leave a comment down below to tell us. This entry was posted in FM Guides | Player Guides, FM18 Guides, Experiments & Wonderkids, Football Manager 2018 and tagged england, everton, FM Guides, fm wonderkids, fm18, football manager, premier league, tom davies. Bookmark the permalink.